Seems like everyone I know is showing this weekend and doing fabulous, and I’m… well, I’m not. At least I’m finally getting lessons again. That’s at least a step forward. 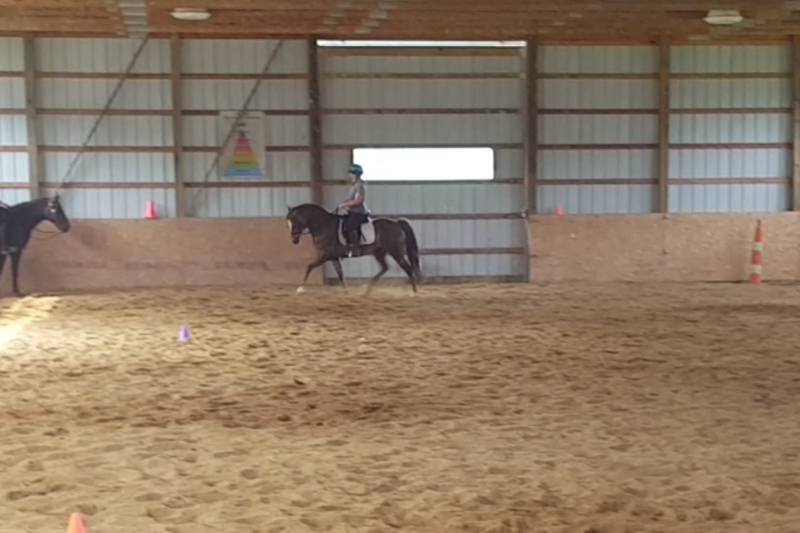 This past Saturday was our second lesson. I had to do some remedial trailer training with Joy last week to prepare for this. She seemed to think she had a choice in staying on the trailer or not, so i made my choice the easier one for her to choose. Anyway, the lesson went well. Joy was once again a rock star. She still has about 10 minutes of jitters, but settled down quickly. We rode this time. 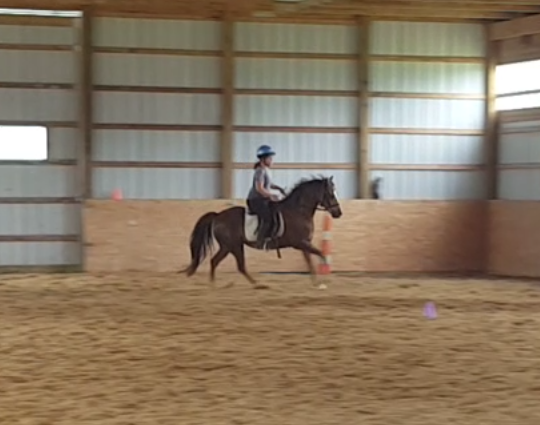 The instructor had me slow Joy’s tempo at the trot down quite a bit. I had a difficult time with this because Joy kept trying to die out on me. I’d nudge her to keep trotting, and then we were too fast. I’d slow her down and her engine would sputter and stall. It took us several laps to figure it out. Once we got it though, Joy felt more balanced. The instructor had us do shoulder-in. My first time showing this to someone knowledgeable and in person. I was nervous. I never have anywhere with straight lines to do these on, and I found out we “wander” quite a bit. In hindsight I probably needed a good half-half and more rider preparation each time we started… I wasn’t understanding the issue at the time. I also can’t seem to keep a consistent bend. We were all over the place. Our canter sucked. As usual. I have some more tricks up my sleeve though. And the instructor gave me an exercise to also try. We’ll see where that gets us in another couple of months. To be honest, I was most proud of Joy for passing the ballons without a second glance. And then for loading in the trailer like a pro AND standing in there quietly while I went to use the restroom. Joy never spooked at anything, never hesitated, gave her all when i asked, and did it without complaint. I couldn’t ask for a better pony! Very proud of her! “My first time showing this to someone knowledgeable.” – Ouch! Consolation prize–I was not showing this weekend either. 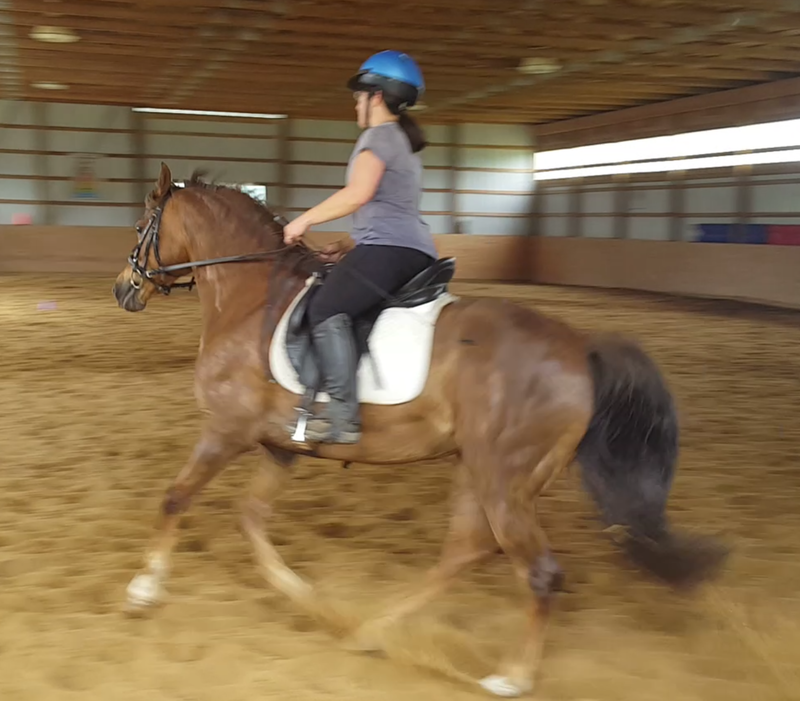 I was at Reins of LIfe in South Bend for their annual benefit dressage show but dragged along my portrait artwork instead of an actual horse…the actual horse has been a night”mare” lately–part of the reason our quadrille is still not ready for prime time!